I came home from working at the library last night & was greeted with the smell of chiles, cinnamon, pumpkin & a just a hint of chocolate, amazing. Nothing like coming home to a dinner cooked by your husband, especially one that smelled & tasted as good as this one. We picked up some baking pumpkins earlier this fall at the farmers' market & Matt said he wanted to use one to make chili. 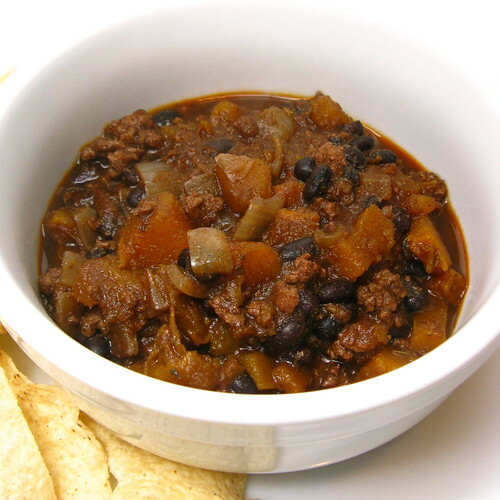 He took the inspiration for this chili from the flavors of molé. It's a rich, dark chili with lots of layers of flavor, a slight sweetness from the pumpkin, spiciness from the chiles, a little bitterness from the beer, smokiness from the cumin and that distinctive flavor of cinnamon. Cut the pumpkin in half, seed & remove pulp. Cut into 8 wedges. Coat with a little olive oil & season with salt & pepper. Place on a baking sheet & roast for about 45 minutes until soft. Remove skin & cube. Save 2 cups for the chili (any remaining pumpkin can be frozen for another use). Heat 1/2 tablespoon olive oil in a large heavy soup pot over medium-high heat. Add the onions and cook until tender. Add the ground beef, cumin, oregano, cinnamon, cocoa, chile powder and cayenne. Cook until the beef is cooked through. Stir in the pumpkin, beans, tomatoes & beer. Let simmer for 45 - 60 minutes until all the flavors blend. Taste for seasoning & salt to taste. My hubby & I love chili & mole! We've tried tons of chili recipes and put a bunch of different ingredients in them. Never pumpkin though. We'll have to try this out. What a great seasonal twist on chili. I'm thinking of giving this recipe a try in the slow cooker. Wow, this is quite an interesting recipe, the spices and chocolate remind me of mole. Looks great! ah, heavens, what i wouldn't give to come home to such a welcome melee of scents. great recipe, folks! Yum, and how seasonal! We're hosting our neighborhood chili fest on Saturday and I'm hunting (last minute, of course) for a chili recipe! Looks like I found one. those flavors sound amazing together. I love the idea of adding pumpkin! Yum that looks like a delicious dinner. A great combo! I just love pumpkin.